Combine dry ingredients in the bowl of your mixer. Add eggs and oil mixing on medium speed until moistened. Add vanilla extract, crushed pineapple, 1 cup of chopped pecans, and bananas and continue to mix until the batter fully comes together. Spoon batter into 3 well greased and floured 9 inch cake pans. Bake at 350 degrees F for 25-30 minutes or until a toothpick stuck in the center comes out clean. Cool cakes for 10 minutes then remove from the pans. Place Cream Cheese and butter in the bowl of a mixer and whip together until smooth. Add powdered sugar and whip until fully incorporated. Add vanilla extract and continue to whip until fully mixed in. Place one layer of cake on your cake plate and frost the top. Place the next layer of cake on that and add another layer of frosting. Place the last layer of cake on top of that and use the remaining frosting to cover the entire cake. 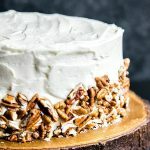 Take the remaining pecans and press them into the sides of your cake, or on top of your cake. You can chop the pecans or use pecan halves. It’s all up to you!